Passionate Pursuits is Bowen’s living legacy. It will inspire audiences to pursue their dreams with tenacity and courage not only for themselves alone. This blog offers a glimpse of the film through pictures and words. We hope you will be inspired to support this project. 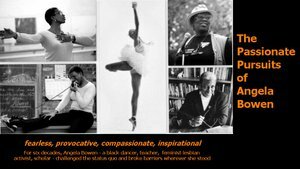 Your donation of any amount is needed to complete the film so that we can share Angela Bowen's legacy this year 2012. Donate $20 or more and receive a gift set of 5 postcards. 100% of the proceeds go directly towards the film's completion.